A study by Exeter University in the UK, published in the Journal of Applied Physiology, reveals that drinking beetroot juice reduces oxygen uptake to an extent that cannot be achieved by any other known means, including training. The research team believes that the findings could be of great interest to endurance athletes. They could also be relevant for elderly people or those with cardiovascular, respiratory or metabolic diseases. The research team conducted their study with eight men aged between 19 and 38. They were given 500 ml per day of organic beetroot juice for six consecutive days before completing a series of tests, involving cycling on an exercise bike. On another occasion, they were given a placebo of blackcurrant cordial for six consecutive days before completing the same cycling tests. After drinking beetroot juice the group was able to cycle for an average of 11.25 minutes, which is 92 seconds longer than when they were given the placebo. This would translate to a 2 per cent reduction in the time taken to cover a set distance. 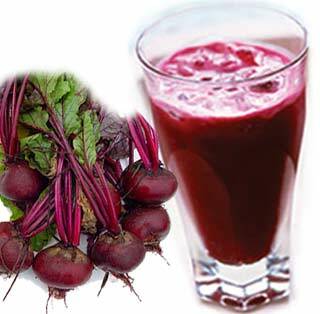 The group that had consumed the beetroot juice also had lower resting blood pressure. They now hope to conduct further studies to look in more detail at the effects of nitrate-rich foods on exercise physiology. This study was well-designed and well-reported. It is, however, important to note that due to its small size and the short-term physiological measurements taken, it does not provide unequivocal evidence that beetroot improves stamina and further research is needed. 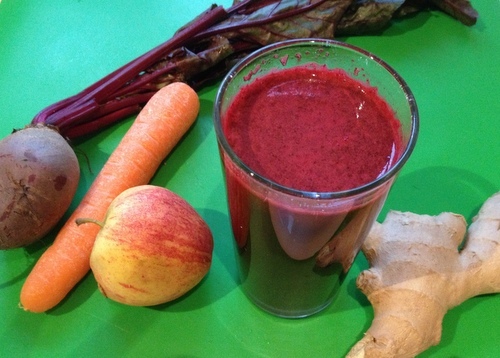 Please click here for a recipe for beetroot, carrot, apple and ginger juice. You can find more free articles and resources on my website and receive further information and news by signing up for my free newsletter.